We all love quoting Osensei to support our own, often contradictory, theories on aikido. After all, his words are uplifting and represent a humanistic philosophy to be admired and emulated. That these words are mixed with paradoxical Zen-like aphorisms only makes them more fascinating and quotable. At the same time a great many of Ueshiba’s mystical utterances are quite unfathomable and clearly belong to a different time and place. Ueshiba on universal themes like love and harmony makes good reading, and good repeating, and Ueshiba on technique is the final authority. But in terms of our own real understanding of and progress in aikido, the Osensei icon could actually be a hindrance.That is if we ‘clothe ourselves in his dogi’ but do not ourselves undertake the whole-time job of getting to understand those truths of which he spoke. Even though Ueshiba’s teachings will always be inspiring, there comes a time when we must think and act for ourselves. Aikido instructors, by the same token, are guides only and cannot do your work for you. They are not perfect and, in most cases, do not claim to be. One should accept whatever they have to say as a product of their particular experience and not necessarily the gospel truth. It may be true for them but not for you. It is all too easy to hide behind a highly skilled instructor or a powerful personality and thus avoid the essential process of self-discovery that aikido is all about. In the end you interpret aikido according to what you are, and your training will reflect that. You can repeat the words of the master, and even copy the movements, but when it comes to grasping the essence, you are on your own. It is easier to say what aikido is not that what it actually is. Thanks to the lack of precedent for budo (martial ways) in our culture, we virtually have to describe the art in negative terms like non-competitive, non-aggressive, not a sport, and so on. For many people these statements are puzzling and contradictory. How can you have a martial art that is not aggressive? After all, “martial” means “warlike”. And where’s the fun in doing something when you have no chance of winning? For most of us who practise aikido these questions resolve themselves in the course of our training, whether we can articulate the answers or not. They become insignificant and, on the contrary, it strikes us as rather strange that people should take them so seriously. This is particularly so when you encounter arguments over which martial art is “the most effective” and international competitions pitting one martial art against another in search of “the ultimate”. Some people will never be persuaded that a creative and non-competitive approach to life is realistic and will argue that society is based on competition and anyone thinking otherwise would be seriously handicapped in the competitive world, i.e., the rat-race. I wonder if it occurs to such people to question whether their great competitive society has been an unqualified success, given the number of ongoing wars, the pitiful plight of vast populations and the threat of total annihilation posed by the “ultimate” weapon? Ueshiba Osensei founded aikido after deeply studying questions like this, rather than searching for the ultimate in “effective” (i.e., destructive) technique. He had been down that road and found it wanting. The art Ueshiba passed down to us is the product of profound insight from which he was able to affirm that “aiki is love”. This should be our guide to what aikido is, rather than the narrow focus on its martial techniques alone, much less technical comparisons with other martial arts. It is easier said than done, no doubt, but by sticking to first principles we can at least see more clearly what aikido is not, and so not have to waste our time on side issues. There is more to life than the rat-race. 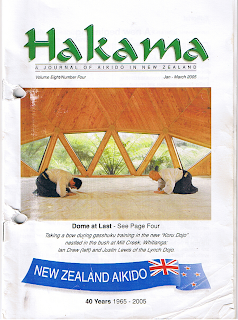 The first issue of "Hakama" was published in December 1995, as a bimonthly publication intended for the New Zealand aikido community, regardless of dojo affiliation, Aikikai, Ki Society, Yoshinkan, Iwama, or whatever. The final issue appeared in March 2005. Circulation was small, and it seemed that some dojos simply passed a single copy around amongst their members rather than encouraging individuals to subscribe. This was disappointing, but far more so was the lack of feedback in the form of articles on Kiwi dojos for publication at no charge, or letters to the editor. My pleas for material to publish resulted in only 10 features on different dojos, and three letters to the editor in the whole 10-year period! We had a handful of international subscribers who seemed to be more enthusiastic than the locals. Even so, I enjoyed putting the magazine together (with layout help from Tony Schaufelberger) and only gave up when other demands on my time made me conclude that the effort involved was disproportionate to the results, and that maybe, after all, not many people were interested. These comments are by way of background to the republishing, in this blog, of some of my editorials from "Hakama" which I think are still relevant and may (hopefully) be of interest. I would certainly welcome any comments. Aikido has come a long way in New Zealand since my wife, Hisae and I started the first dojo back in 1965. However there are still many people who have never heard of the art, and it is partly with them in mind that we have launched this modest publication. It is also our hope that Hakama will help to bring aikido students throughout the country closer together and provide a forum for an exchange of views. To this end we invite contributions from one and all. New publications such as this often start with ambitious announcements, only to close down within a short period and subsequently lay the blame on lack of support, so we will not make too many promises in this first issue, recognising that the future of Hakama will depend mainly on our own efforts. In is also usual to issue a disclaimer to the effect that opinions expressed in the publication are not necessarily those of the publishers, but the chances are that most of the opinions herein will be our own, until such time as our readers take up the invitation to submit their views, and we make no apology for holding firm opinions on some subjects. One such topic is brutality in the dojo and, despite the unfortunate existence of many precedents throughout the aikido world, we reject this completely and will be campaigning against it in these pages. Use of excessive force, whether or not it results in injury, cannot be excused under the guise of hard training, or blamed on bad ukemi. To my mind there is a clear trade-off when one decides to pursue aikido, the Way of Harmony, rather than any of the numerous other martial arts, and that is the renunciation both of force and the competitive attitude, in order to seek the deeper meaning of the art. You can't have it both ways. In offering this new publication for New Zealand aikido enthusiasts we should also like to acknowledge the many instructors whose efforts during the 15 years that we were in Japan, and since, are largely responsible for the popularity of aikido today. I bow to them and hope that we will have the opportunity to feature them and their dojos in future issues.